Discover amazing sights and delicious delights in the heart of the Mission District. Take a journey off of the well-worn tourist trail with experienced guide, Christian and his team. With an impressive background in global travel, this voyager founded a niche job board for those who thrive on adventure, is co-owner of a local tour business, and was once a senior tour leader for a group tour company. Get an authentic, local point of view in San Francisco with Christian and his team of knowledgeable guides! Begin this exciting 2-hour tour with coffee and artisanal donuts made with organic ingredients, and flavors that include bacon maple apple. Then, visit a local Mexican bakery with authentic treats, like pan dulce, made on-site daily. You'll proceed to the neighborhood's legendary murals, where your guide will provide you with their incredible 30-plus year history. Recharge afterwards with strawberry rhubarb pie or roasted cauliflower and black olive quiche from a local eatery. 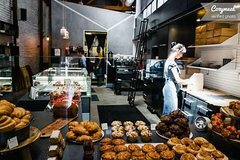 Finally, you'll visit a famous Mission District taqueria where specialties include carne asada and al pastor, then grab a snack at one of the trendiest bakeries in San Francisco.